First Dips: Every Monday, we chat with our friends to find out what ticks their musical impulses and fancies. What was their first hip-hop or urban music love? Touted as a promising artist to watch for by renowned music producer Bob Ezrin, Singapore folk troubadour Nicholas Chim has two albums and numerous awards under his belt. 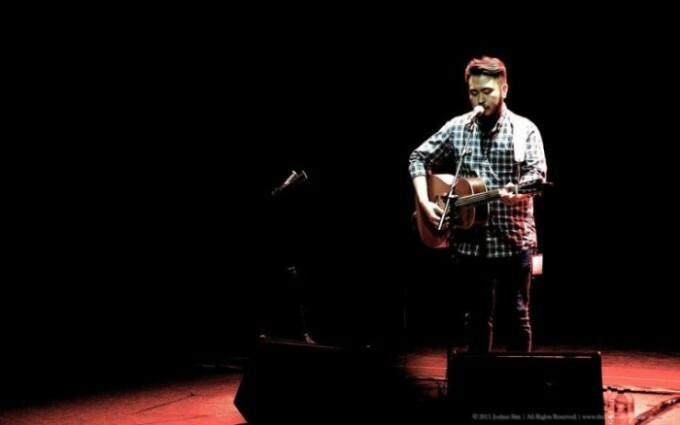 His melancholic acoustic tunes have struck a chord with many listeners, particularly with the LGBT community in Singapore. Nicholas subsequently went on to write scores for commercials such as Tiger Beer’s cross-cultural creative platform, “Tiger Translate” and French apparel company Lacoste. He has attended the inaugural Japan Music Week in Tokyo and Chiba in 2011, touring Hong Kong in 2013 and opening for Kina Grannis and David Choi during their Asian Tour. 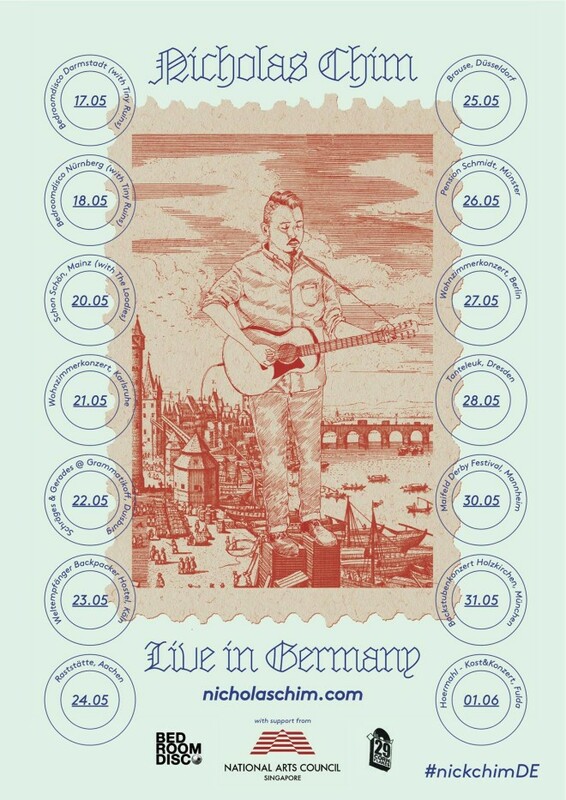 He is about to embark on a 14-date Germany tour mid May 2014. We grab hold of the bearded one and asked him about how this tour came about. So what got you to go out and book yourself a 14-tour show in Germany? The only Singaporean act which has done such intense touring so far is grindcore act Wormrot. I think it’s a mix of desire and bloody luck really. . With the Internet connecting people across the world right now, I sincerely believe that it’s possible for every artist to find a sizeable audience for their craft. Even if your hometown crowd is enough to support you, you always have to think bigger. I’ve been lucky to meet Dominik (my promoter in Germany) through a friend I made at (now-defunct arts café) The Pigeonhole. This only happened because I dared to dream big. What are you hoping to gain out of this tour? We understand you will be away on the road for a month! I’m hoping to make lots of friends along the way and have more people discover my music. This tour has been in the works for several months so I’m really excited it’s finally going to happen! Follow my social media channels or the hashtag #nickchimDE to find out what’s happening on my tour. There is a new album out soon. How’s that coming along? Once I’m back from the tour, I’ll be finishing up 4 songs with my live band and head into the studio to record. I’ve recorded two full lengths before. So this time around, I’m planning to do 2 EPs instead. The new material definitely doesn’t sound as depressing but will stick a knife in your heart. I hope people will like it! So what’s up with this thing of you attracting a strong lesbian crowd? Haha, it was never my intention to specifically aim for a lesbian crowd! Sexuality is a personal choice, not a marketing factor. The persona I take on in my songs has always been as a man victimized by feminist theories. Because of that, the music seems to be most attractive to strong and independent women. I’m just lucky to have an audience for my music in this little island overflowing with talent. Rumours have been saying that when you are drunk, you proclaim that you are a black man trapped in a Chinese man’s body. And the best thing is that you will start to rap… Folk and hip-hop are quite different in nature. What drives your interest in Hip-Hop? I think I’m attracted to the aggression and working class stories in Hip-Hop. I still listen to Wu-Tang Clan’s 36 Chambers whenever I had a bad day. That struggle to get out of the ghetto is something I can relate to. It’s the same with folk. Yes, there are sappy love songs there. Look deeper and you will find similar aggression and desire. Ah, what’s your all time fave Wu-Tang tune then? I guess I’m one of a rare bunch who still only listens to an entire album. But I can’t remember the name of a single track. Haha. Out of 36 Chambers, ‘7th Chamber’ is my favourite because I love the dialogue at the front. It’s so raw and powerful. That’s something I want to bring to each performance every time.